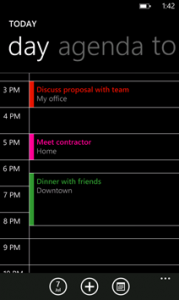 Windows Phone has a very easy calendar program to use that allows setting all kinds of events. With this calendar, which we can very quickly configure, we will be able to see all the detailed events from smartphone applications. The calendar is not only available only from the phone, but it is synchronized with our account and we can access it from any device. 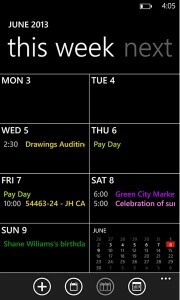 When we create a new calendar event, we block a space of time, reserving it for some activity. Depending on the details we want to include, we can go from simply booking an undefined time for the event, to add all kinds of details. To create it, we need to enter the calendar option that we can find in the start menu. Once there, we can click on “New” and then enter a subject, location, date and other details. We can also define whether an event will be periodic or not, being able to change this status with the “Frequency” option. We may also invite other contacts to some specific events, which can be very useful for business meetings. At any time we can edit or delete the events that we have created in the calendar. To do this, we only have to access the calendar (from the Start menu) and click on the event we want to modify. When we access, we will have the option to edit all the details or even completely eliminate it. However, we cannot change the account in which we have saved the event. If we want to change it, we first have to delete the calendar where we have that event and reset it in the account where we want it to appear. If we want to delete a canceled meeting from our calendar, we can it from the email. From there, we will have the option to “Remove from Calendar”, which can be found under the “More” icon. We may respond or modify meeting requests from the calendar. Clicking on a meeting, we can confirm our attendance by clicking on the icon to accept or reject it if we can’t go. We may also modify the proposal, either by sending a comment (using the reply option) or changing the time of the meeting, in which case the proposal will be sent to the other members. For any change or comment on a meeting already set, we can always send a mail to all attendees. We will also have the option to warn them if we are going to be late just checking the “I’m late” option.